Q: According to reports, President Paul Kagame of Rwanda, on the sidelines of the Europe-Africa Summit in Vienna, Austria, mentioned China-Africa cooperation and Africa-Europe relations in an interview with Austrian media. President Kagame said, "China's engagement in Africa is a good thing. China is very active in Rwanda, but not in an inappropriate way. We know our capacity and which Chinese proposals we should accept, so as not to be overloaded with debt. It depends on us Africans. Don't we know how to get along with China? Europeans' hypocrisy is shocking". What is your comment? A: I have noted relevant reports. We all know that when conducting cooperation with Africa, China follows the principles of sincerity, real results, amity and good faith and upholding justice while pursuing shared interests. In recent years, the practical cooperation between China and Africa in various areas has achieved fruitful outcomes. The African people are fully alive to the genuine feelings of the Chinese people and the tangible benefits brought about by China-Africa cooperation. 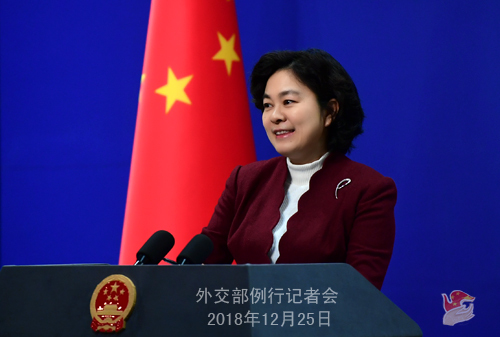 It is an undeniable fact that China-Africa cooperation has been sincerely welcomed by African countries and peoples and received positive comments from the international community. China always emphasizes that the African countries and peoples have the right and capability to independently choose their cooperative partners. When carrying out cooperation with Africa, all relevant parties of the international community should listen to Africa's voices, trust Africa's wisdom and respect Africa's will. Pointing fingers at Africa and making irresponsible remarks on China-Africa cooperation in disregard of facts or out of political purposes will definitely not get the approval from Africa. 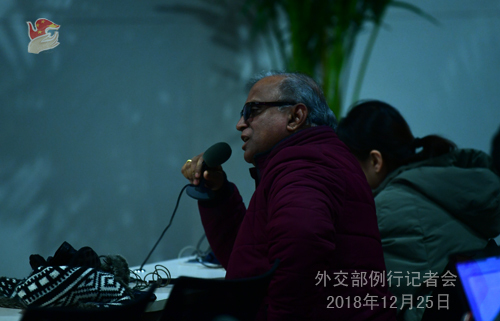 Q: A couple of days ago, China and India successfully held the first meeting of the High-level People-to-People and Cultural Exchanges Mechanism. What are the special considerations for the two countries to launch the mechanism at this point? A: Establishing the China-India High-level People-to-People and Cultural Exchanges Mechanism is an important consensus reached by President Xi Jinping and Prime Minister Narendra Modi during their meeting in Wuhan in April this year. Enhancing people-to-people and cultural exchanges between China and India, the two ancient civilizations in the world, can help carry forward the tradition of exchanges and mutual learning between the Chinese and Indian civilizations, meet the aspirations of the two peoples for exchanges and mutual understanding and satisfy the current needs of developing bilateral ties in an all-round manner, thus boasting huge room and potential for development. This year, President Xi Jinping and Prime Minister Narendra Modi held four meetings. Under the strategic guidance of the two leaders, China-India relations have demonstrated a sound momentum of development in an all-round way. 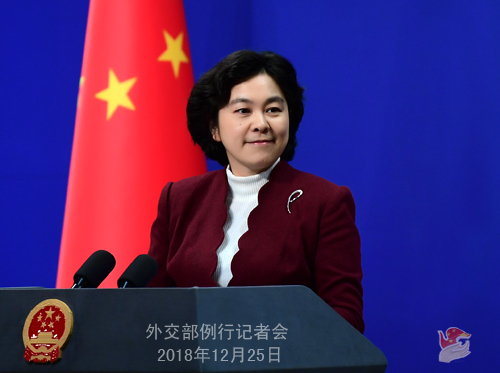 Officially launching the mechanism at this point is an important step to implement the consensus of the two leaders, an important measure to promote the growth of China-India relations in an all-round way as well as setting up an important platform for the rejuvenation of the oriental civilization. It will help cement the public support for bilateral ties, promote the sound growth of China-India relations, and enable different civilizations to co-exist in harmony and jointly uphold peace and stability of the world. Several days ago, State Councilor and Foreign Minister Wang Yi successfully co-chaired the first meeting of the mechanism with Indian External Affairs Minister Sushma Swaraj in New Delhi and reached a series of important consensus, which marked a good beginning of this mechanism. Going forward, we hope that the relevant departments from the two countries will leverage their respective strengths to carry out various and colorful activities in the eight key areas of cultural exchanges and preservation of cultural relics, education cooperation and language teaching, tourism cooperation and personnel exchanges, youth and sports exchanges, media exchanges and media environment and academic exchanges and co-production as agreed by the two sides so as to deliver tangible benefits to the two peoples, attract more people, including more youngsters to devote themselves to the great cause of China-India friendly exchanges, foster wide-range exchanges and cooperation involving the 2.7 billion people in our two countries, and lay a more solid social foundation and create a more favorable climate of opinion for the Chinese dragon and Indian elephant to dance together. 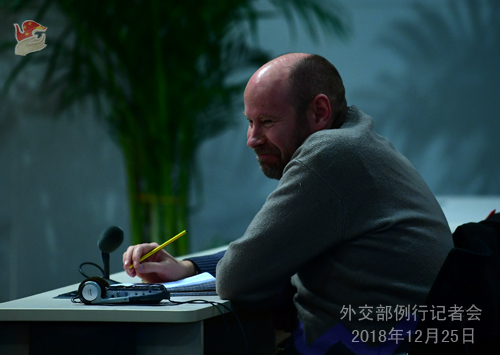 Q: The French Foreign Ministry on Monday issued a statement to express concerns about the detention of the Canadian nationals in China and urged China to treat them with fairness. What is China's reaction to this? Is there any update on the cases of Canadians who are in detention? A: We have elaborated on relevant situation with regard to China's competent authorities respectively taking compulsory measures against and imposing administrative penalty on two Canadian nationals in accordance with the law. As to the relevant French statement you mentioned, we firmly reject and oppose it. When taking similar questions yesterday, I have made clear China's position. China's competent authorities detained the Canadian nationals who are suspected of engaging in activities that undermine China's national security in accordance with the law, while the Canadian side, at the behest of the US side, illegally detained the senior manager of the Chinese company. They are different in nature. 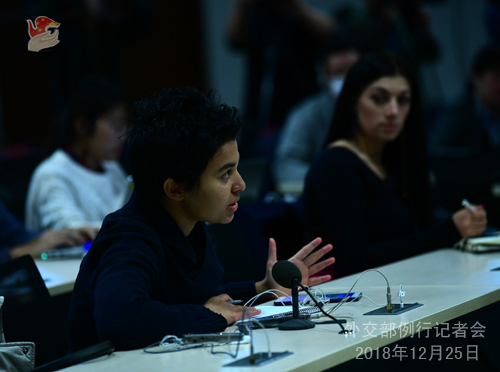 We hope that the Canadian side, the French side you just mentioned and the other so-called allies of Canada can respect Chinese judicial authorities' right to independently handle cases as well as China's judicial sovereignty. I cannot understand why the French side issued such a statement and why it speaks for Canadian nationals. This has left a very bad impression on the Chinese people: France only cares for Canadian people and does not care for Chinese people. Q: Is Pakistani Foreign Minister visiting China now and is it connected to the current situation in Afghanistan? A: This morning, State Councilor and Foreign Minister Wang Yi held talks with Pakistani Foreign Minister Shah Mehmood Qureshi who made a special trip here. The two sides had in-depth discussions on the latest developments surrounding the situation in Afghanistan and reached broad consensus. The two sides agreed that military actions will not help solve the Afghanistan issue and political reconciliation represents the only practical and viable way out of it. The two sides welcomed the miscellaneous efforts made by all parties and expressed commitments to staying in close communication and strategic coordination. The two sides also agreed to deepen China-Pakistan all-weather strategic cooperative partnership and continuously elevate all-around cooperation. Follow-up: How does China view the US decision to pull out of its troops from Afghanistan? In fact, there are mixed reactions from the neighborhood. It is concerned that this move may escalate tensions. There is already violence reported from Kabul today. A: The US side makes its own decisions on whatever actions they take. For us, our position on the Afghan issue is consistent. We always believe that military actions will not help solve the Afghanistan issue, and only an inclusive and political reconciliation process led and owned by the Afghan people can offer a practical and viable solution. China has been playing a constructive role in encouraging all parties in Afghanistan to achieve reconciliation and cooperation. We hope that all parties could work together to expedite Afghanistan's reconciliation and cooperation process so that the Afghan people could enjoy peace, security and development at an early date. We believe that it will be a good thing for the whole South Asia region if Afghanistan can realize security, stability and development at an early date.